A range of different Halloween decorating themes and ideas to put the fright back into All Hallows Eve! There’s just something about a foggy night which says spooky and what night should be spookier than all the others? Halloween of course! Whether you’ve chosen to go with a graveyard theme or a zombie decor or something completely different for Halloween this year I’m betting you can make it even better with a fog machine. This fog machine is the best selling one on Amazon and seems to do a great job for party use, I like to use it outside as opposed to inside because most fog machines tend to get a little hot when used inside. The key to getting a great effect is to use the right liquid aka fog juice as it’s called. When you buy this particular fog machine it comes with a bottle of fog juice that you can use, unfortunately this can cause the machine to get a little plugged up. This can be fixed by running water through the machine after use, but I’d recommend getting a different fog juice. In the States I’ve been told that Froggy’s Swamp Juice works beautifully in this machine so I’d try that out and see what a difference it makes. Getting the right ‘juice’ really is the key to making the right fog for you so experiment before the actual day so that it’s perfect if you’re holding a Halloween party. Now I’m sure you’re wondering about making your own fog juice and you’ve seen that it has to be water based so you’re about to start searching the net in an attempt to save money for your Halloween event – am I right? Don’t do it! There are lots of problems with making your own fog juice that far outweigh any of the economic savings that you may make. One way to ensure that your party is remembered for all of the wrong reasons is by poisoning your guests with formaldehide (a colorless, toxic gas that can be released if you get your chemistry wrong when making up your fog juice). Save any mad scientist urge for your Halloween decor and not for mixing your own ‘juice’ and you’ll have a great party with plenty of atmosphere! Create a Bathroom Worthy of The Bates Motel This Halloween! There are so many different ways that you can dress up your bathroom for Halloween, but I think a bloody bathroom is one of the best. Using this Bloody Shower Curtain and building your bathroom decorating around it can give you a great Norman Bates inspired bathroom. This is guaranteed to leave your guests a little on edge when they go to wash their hands and I doubt you’ll have any long queues as people won’t want to linger where it looks like there’s been a murder! As soon as I saw this bloody shower curtain on Amazon I could almost hear Janet Leigh’s scream and I just knew what was going to be in our bathroom this Halloween! 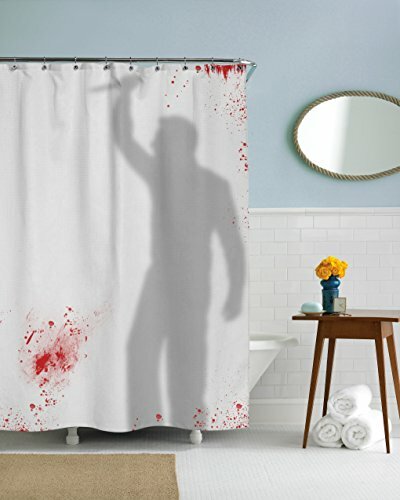 Read on to see how you can expand on the idea behind this shower curtain to create your very own bathroom of gore – I’ll even share my Psycho movie story with you ……. it’s not just Janet Leigh who can scream! In a Hurry? Check out all the bloody bathroom Halloween decor deals. Creating a Bloody Bathroom SceneWhen I saw the above shower curtain I could hear Janet Leigh’s scream in my head, but if you want to replicate it you could try this shower curtain below that is also inspired by Norman Bates. It comes with a sound box and replicates her scream as people walk into the room – now that’s a great Halloween trick! The shadow as well as the blood is guaranteed to make me jump when I see it, even if I’ve put it there myself! Okay this shower curtain DOES NOT contain the sound box, unfortunately the one I used to feature doesn’t appear to be available anymore, but this is still a cool idea for a shower curtain. Who’s Norman Bates, what scream? If you’re asking these questions then you haven’t seen the movie Psycho, it’s an absolute classic and Janet Leigh gets killed in the shower when Norman Bates stabs her – now it makes sense doesn’t it? While we’re talking about Psycho let me tell you about my introduction to the movie…. The 1st time I ever watched Psycho was years and years after it was released and what was I doing? Staying in a motel with my hubby. This proved not to be a very good idea. I was having a shower the next morning (and yes there was a shower curtain) and my hubby came in to see if I wanted a cuppa….I saw the shadow outside of the shower and did a great impression of Janet Leigh! – I’m not allowed to watch Horror movies in motels anymore! Back to creating a bloody bathroom. If you don’t use a shower curtain then don’t despair you can still create a bloody bathroom feature by using bloody Halloween clings on the inside of a shower door or the outside of the bathroom window and a bloody bathmat just by the shower is a great touch too. More Bloody Halloween Decor for Your BathroomThere are lots of different ways of creating a bloody bathroom besides a Norman Bates inspired shower curtain. A great idea is to start off with some crime scene tape and putting it across the bathroom door signalling a crime scene ahead, a liberal amount of fake blood and bloody Halloween clings around your bathroom could create soem great atmosphere. Not only would this be a fantastic idea for Halloween you could also have a themed Dexter party when the new season begins and create a bloody bathroom for him to investigate. Alternatively if you want a night in with friends watching horror movies then you can create a bathroom for a bit of fun – I’d hate to be the first unsuspecting guest to need to go to the bathroom! It would certainly be a night that would be talked about for some time I imagine. Have you ever decorated your bathroom for Halloween? If so did you go with a bloody bathroom theme or something else? Let me know in the comments as you could end up giving us all some great Halloween decorating ideas. On the Halloween Party Lights post I actually share with you a way to create home made Halloween lights to place along the path leading to your house, but there are lots of other ways in which you can decorate your garden path. These Halloween hedge lights however will really add some spookiness to your pathway. If you have a hedge, bushes or even a few potted plants you can really creep your guests out with the haunted hedges eyes above. What could be hiding in the plants ready to jump out at them? It will also fill them with trepidation wondering what else may be lurking around your spooky house. Another option which is really cool is the spooky eyes – see them in action below! Buy the Spooky Eyes here and add some fright into your Halloween! Other ways of decorating your pathway can be with Halloween string lights in your trees, lighted cauldrons or even light-up animated props on your front lawn. Check out my Halloween Party Lights site above to get more ideas on how to really light up your Halloween decorating. I love to get the fine spider webbing and drape it around both inside and outside (see below if you’re not sure what I’m talking about) and I also love the motorised spiders that will suddenly descend down and land on someone’s shoulder/head or in their plate/glass etc! I actually don’t have one of these, but I’ve seen one in action and it’s really awesome. There are lots of other ways to add spiders into your Halloween decor and they include lights – there are so many different spider lights available from tea-lights to string lights and you can check out a great selection at – Spider Halloween Lights. The great thing about using spiders in your decoration is that you can combine them with so many different themes like the haunted house, the Halloween graveyard, the dungeon or even the mad scientists lab. It also means that if you’re short and didn’t reach up high with your dusting leading up to having friends around to celebrate they’ll think your spiderwebs are actually part of the decor! 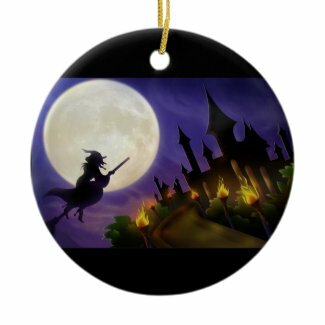 We’ve discussed having a Halloween Tree on another post, but what about getting ornaments to hang on your tree? You can have a small Halloween tree or just get a full sized black Christmas tree and use it as a Halloween tree as well. There are lots of different ways to decorate it and you can get lots of ideas on my Halloween Christmas Tree Ornaments webpage. On the webpage I’ve linked to above there are lots of different Halloween tree ornaments that you can use to decorate for Halloween from pumpkins to ghosts, witches to black cats and more. I love the idea of these ornaments because if you enjoy Halloween like my daughter then you can ‘recycle’ these ornaments for Christmas and I love things that can be reused more than once a year especially my Halloween decor.